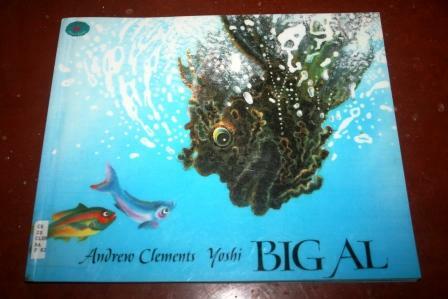 We love the book Big Al, by Andrew Clements Yoshi. Big Al is a big, ugly looking fish who just wants a friend. But the other fish are scared of him, and run away when he tries to talk to them. It's a sweet and charming book, so we decided to do some activities based on Big Al. 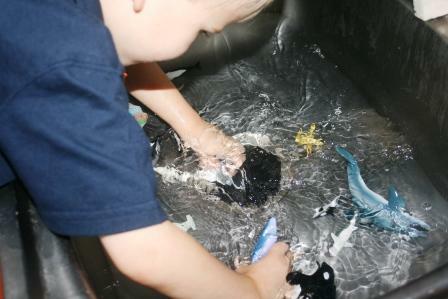 First, we played with our dolphin collection in the sink. I got this idea from a commenter on JDaniel4sMom's blog. It was a huge hit, and Pierce said it was the highlight of his day. Later, we added some tupperwares to make islands and boats. Then we started our big craft project. We used a paper plate, painted blue. We added shells from our trip to Ocean Isle Beach, some moss we gathered in the yard, and foam fish stickers. 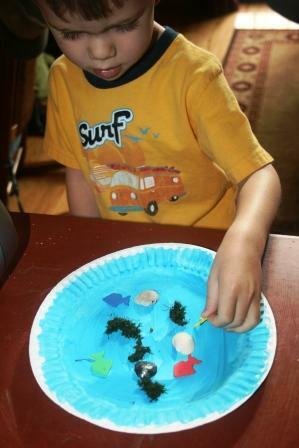 Then Pierce went to work with the green glitter glue stick, making swirls of waves. We used another paper plate, painted gold, to make the window. Voila! Just like looking out the porthole of a ship. Pierce really enjoyed learning about what a porthole was, and exploring the ocean. JDaniel wants to do these project. He came over to look at computer and declareed that he needs fish just like yours. 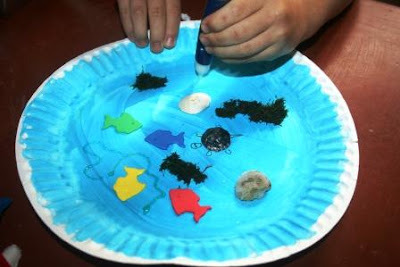 I need to find that book--and my sons always love some sea crafting. They're obsessed with sharks and fish and oceans. What an adorable activity and a great book too! Looking for that one in our library this afternoon! Thanks for sharing! It does look just like the window of a ship :) Really it is so cute! SO good to see you again!!! Thank you for all your wonderful comments while I was sick! I really missed my visits with you. I love this craft and am saving the pictures to make it with the girls!!! And the book, I wrote the name down and want to go look at it, it sounds SO good!! How cool! My kids can't wait for school to be out so they can do some fun things around our house this summer. You are so creative! I am a HUGE fan of extending storytime beyond the pages. This is wonderful. You do the greatest things. Art and a lesson. Hey a question - do other people, when they bring your blog up, mention that internet explorer comes up and asks if I want to navigate away from the page? It has done it forever - just now asking. 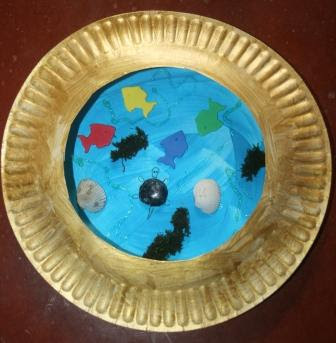 Oh, that porthole turned out really cute...I miss doing projects with my daughter when she was young - it's so much fun and it keeps you young at heart as well.. 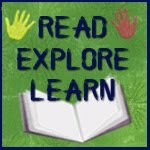 I bet your kids would love the Los Angeles Childrens' Museum - it's a hands on learning environment and geared towards young (and young-at-heart) minds.